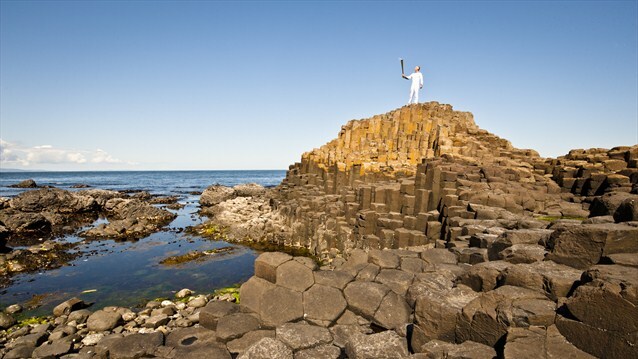 I have trouble with the Giant’s Causeway, aesthetically. Too famous perhaps. Not enough room for manoeuvre and nuance. Its myth already written. When dwelt on, its geology is rather unromantic, a tourism coup. 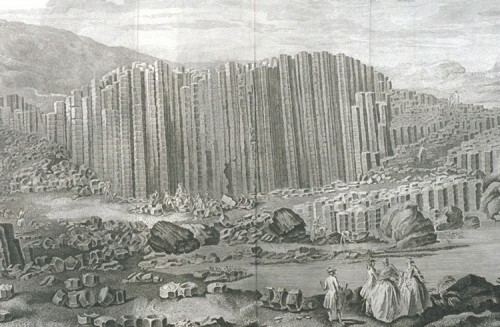 As if 60 million years ago the earth somehow knew humans would arrive with a lust for the picturesque, the basalt columns less wonder than comedy. Growing up here, my family tended to avoid it, venturing down to the Grand Causeway only when we had visitors. We preferred the nearby beach at Runkerry, where the basalts are gnarled and unruly, or the cliff top walk further round. Lately though, somewhat a visitor myself, I always like to fit in a trip. Today, soaked June, visibility nil, we walked with the other rain-coated pilgrims down under the relative shelter of the cliff. Martins spun and spiralled, a peregrine or kestrel – hard to tell through steamed-up glasses – rested on a twenty metre high ledge. And that’s the untold thrill of the Causeway: the cliff that towers above. On the ascent are the seeping red rocks of the Port Na Spaniagh laterite, then, at Windy Gap, oily bulbous boulders, tar-black. These, my guidebook told me, are basalt rocks that have been rotted by physical and chemical weathering: ‘onion weathering’ because of their concentric layering like the inside of an onion. Passing them, we turned the corner and could see right across the curving bay to the Chimney Stacks, the teeth of the Organ, and the red shock of the interbasaltic laterite that cuts through like a layer of jam, separating the Lower Basalts from the Causeway basalts above. Tourists huddled in groups on the Grand Causeway, jumped from column to puddled column. They’ve been doing it since the sixteen hundreds. No one was able to tell them then what to us seems quite simple: intense volcanic activity caused molten lava to intrude through chalk beds and form a massive lava plateau, the lava cooled rapidly, contraction occurred, the rocks fractured in a similar way to drying mud, leaving the mostly hexagonal basalt columns. As we climbed the Shepherd’s Steps we heard the familiar flint-grate sound of stonechats before we saw fledglings, little balls of fluff, taking tentative hops over the damp branches. Looking down from the top of the cliff, the Causeway stretching out into the sea, Scotland appeared as a murky smudge on the horizon: somewhere over there are the corresponding basalt columns at Fingal’s Cave, part of the same ancient lava flow, on the Isle of Staffa. According to legend, this is the end of the causeway built by Finn McCool in order to fight Benandonner. To the west, the hills of Donegal appeared, and the reptilian Skerries, a slither of intrusive igneous, sitting about a mile out in the water. There’s a scuttled U-Boat in the depths nearby. We followed the paths back inland towards the new car park and the main road. The visitor centre, smooth black basalts and grass roof, is due to open in a month’s time. I suppose if there’s poetry to be written it’ll have to do more than describe the place, do more than transcribe geology or translate myth. As is so often the case, Seamus Heaney does just that, in a poem from ‘Squarings’, one of the sequences in Seeing Things (Faber, 1991). With intermittent phone signal we found the poem online and read it in the shelter of the hill-top pub. Outside the weather descended, and the fields, the beach, the cliffs and tourist train were shrouded in heavy ropes of horizontal rain. The small of your back made very solid sense. You gathered force out of the world-tree’s hardness. If you stretched your hand forth, things might turn to stone. Beyond the range you thought you’d settled for.